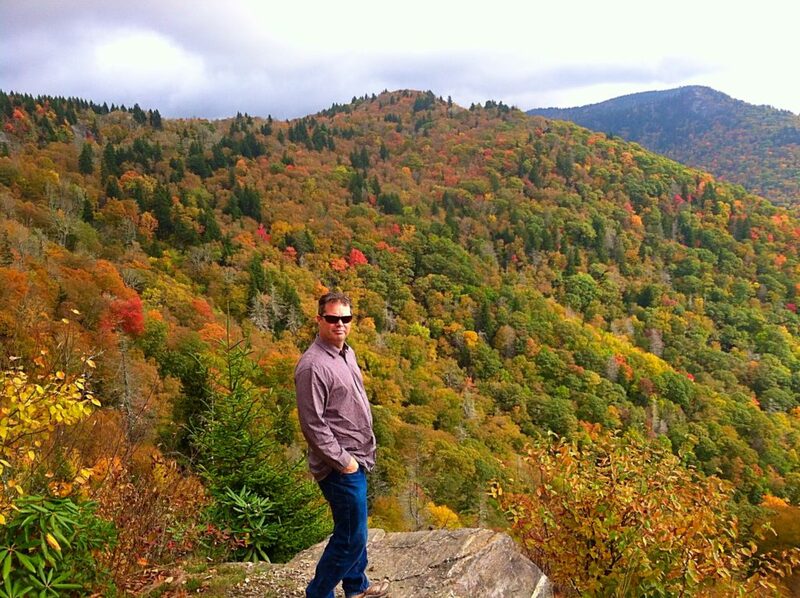 Fall is my favorite season here in the mountains of North Carolina. The weather is usually crisp and dry with skies as blue as lapis. 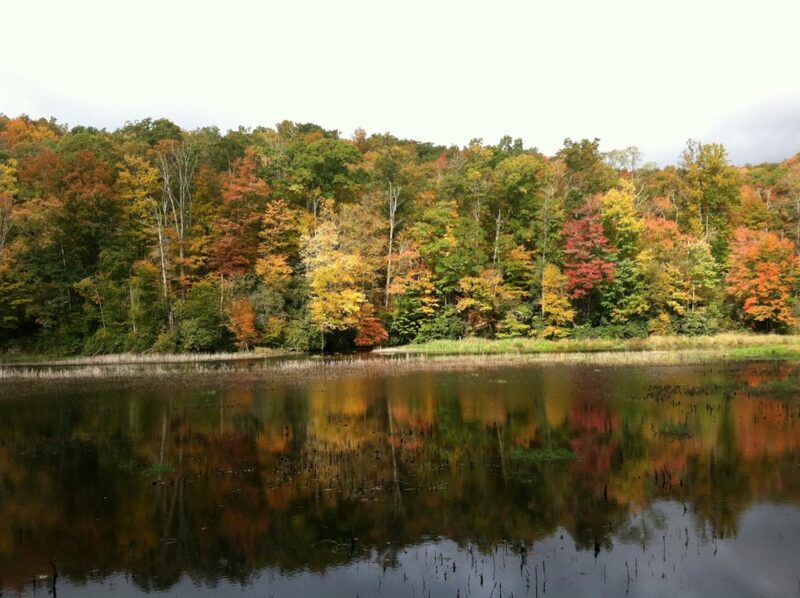 Once the leaves start to turn, the colors change almost overnight. On Monday, the leaves were green, and by Friday they had almost all begun their transformation. Brilliant yellow, vibrant red, and glowing orange leaves fight to catch your eyes. 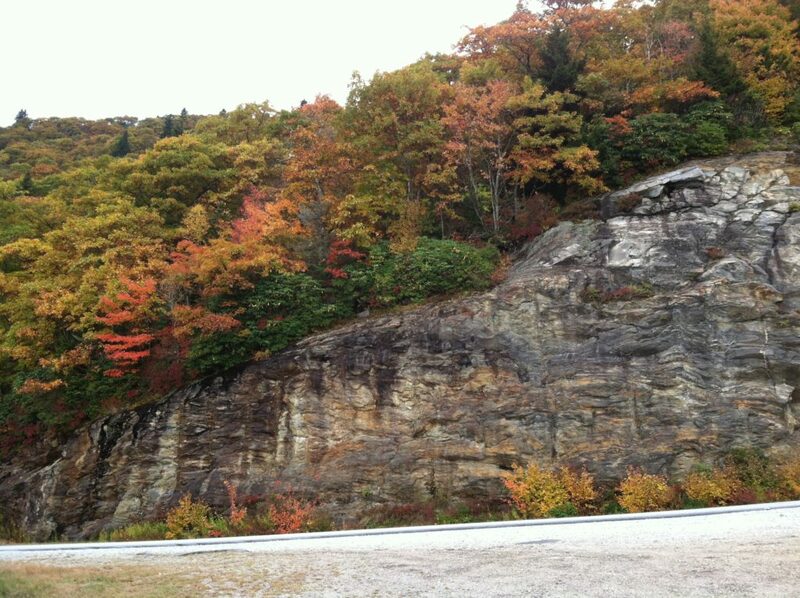 It is the perfect time for a drive up to the parkway. From the cabins, we turned left on to Hwy 107 going north. Hwy 107 winds its way down the mountain from Cashiers to Sylva, passing through Tuckasegee and Cullowhee, the location of Western Carolina University. We wanted to stay at higher elevations since the leaves were just starting to turn, so we drove 9.2 miles to Tuckasegee, and turn right onto Hwy 281, also called Canada Road. It winds its way up into the high mountain farming community called Little Canada. I am not sure where it got that name, but one story I have heard was that when the moonshiners from that area where asked where they lived, they would say Canada to hide their location. About 8 miles up Hwy 281, we turned left onto Charlie’s Creek Road (251) which goes past the Little Canada Community Park (very nice bathrooms). This is the same route we took in the winter to Balsam Lake, and we stopped there again today. Balsam Lake is 5.3 miles down Charlie’s Creek on the right. I have been playing around with the Hyperlapse App on my phone, and I took some video of Charlie’s Creek Road as we drove along. The roads here are very curvy, so it wasn’t alway easy to keep still. Balsam Lake is always beautiful and serene. Very few people seem to make the trek up to this high mountain lake, so it is pretty quiet. It is a great spot to stretch my legs after sitting in the car about 40 mins. Back in the car and continuing on another 5 miles past Balsam Lake, we turned left on Hwy 215 toward the Blue Ridge Parkway. 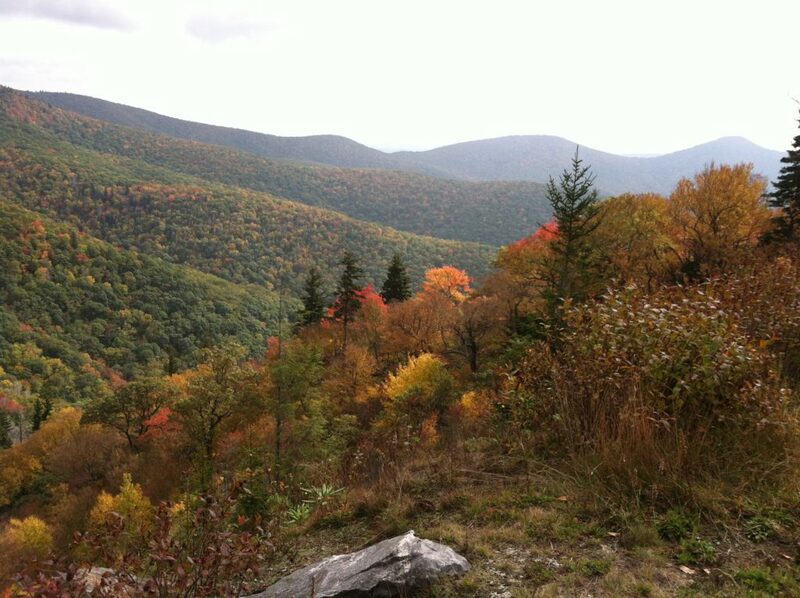 The leaves were really turning here, and, as you get close to the parkway, the vistas off to the left were amazing. It is about 3.2 miles from Charlie’s Creek Road to the entrance of the Blue Ridge Parkway, but instead of turning onto the parkway, we decided to keep on going down the other side of the mountain to Waynesville. There are plenty of people out to see the leaves, and we even passed a Porsche rally going the other way. At each turn in the road, we kept saying “Wow, look at that!” as each tree seemed to top the next one for beauty. About 4 miles past the parkway entrance is a waterfall on the left. 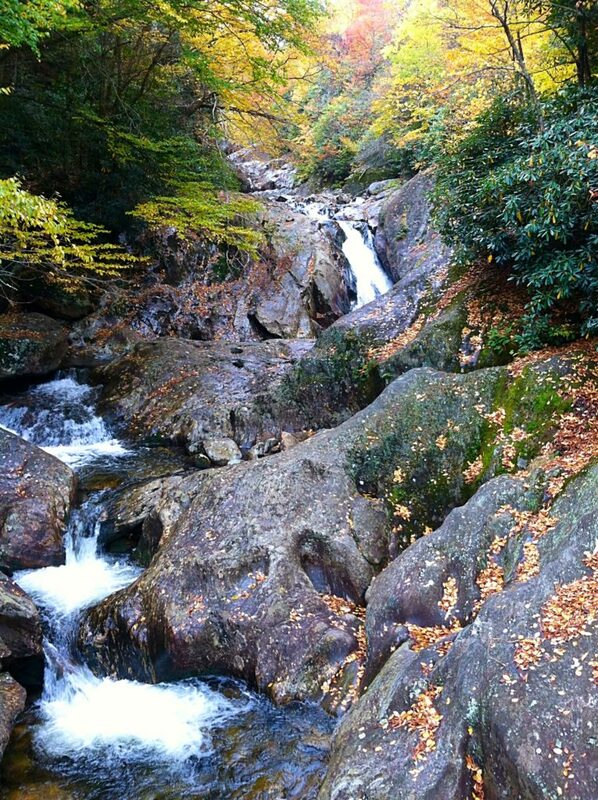 It took some internet research to find its name: it is either called Sunburst Falls or the West Fork of the Pigeon River. There is parking just past it, so don’t stop in the middle of the road to take a picture. The river flows under the road through a pretty arched stone bridge. Another 7 miles or so down the road, there is a private lake on the left. This is Lake Logan. Earlier, it was a logging village called Sunburst, but the valley was flooded to create a lake for the Champion paper mill downstream. One interesting note I found about Sunburst is that is was a location of the Biltmore Forestry School headed by Carl Schenck from 1910 to 1913. The first location of the school was in Pisgah Forest near Brevard, now a commemorative historic site called the Cradle of Forestry. We continued driving, and at Hwy 276 turned left to go into Waynesville. Waynesville has a cute downtown, great for walking around. Today, we had to head back home, so we jumped on Highway 23 and followed it west to Sylva. From there we took hwy 107 back home.